Photo courtesy of Julia Heinen, professor of clarinet. For Julia Heinen, performing music written by living composers is a special experience. The chance to work directly with the composer, crafting the music the way the composer hears it and bringing that vision to life for an audience is extraordinary. This led Heinen, a California State University, Northridge professor of clarinet, and Daniel Kessner, a CSUN professor emeritus of music, to start the Tempo Ensemble at CSUN a decade ago. To this day, the ensemble includes faculty and alumni who are passionate about contemporary music and are dedicated to preserving it. 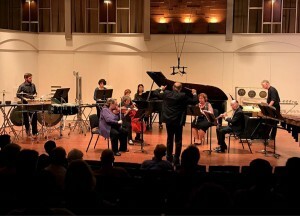 The Tempo Ensemble, which stands for The Epicenter Musical Performance Organization, performs contemporary music, works spanning the 20th and 21st centuries. Heinen is the only founding member still teaching on campus. The Tempo Ensemble includes woodwinds, strings and percussion instruments. The ensemble performs two concerts a year, one in fall and one in spring, with occasional special performances. The next performance will be Feb. 10. To choose a work for the spring performance, the group asks students and professional composers to submit their works at the beginning of April. By the first of August, all musicians receive their music, usually four to eight works, and they begin rehearsing together 20 days before the program. 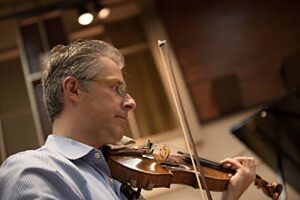 Lorenz Gamma, assistant professor of violin and head of string studies. Photo courtesy of the Tempo Ensemble website. Contemporary music, although included in the CSUN music curriculum, is not performed as often as older pieces, such as those by Beethoven. When students are studying an instrument, there is a body of music they spend most of their lives playing. When students have mastered those works, then they can decide to move on to contemporary music. The Feb. 10 program at CSUN’s Cypress Recital Hall will include six works of music, including “Two Visions” by Daniel Kessner.